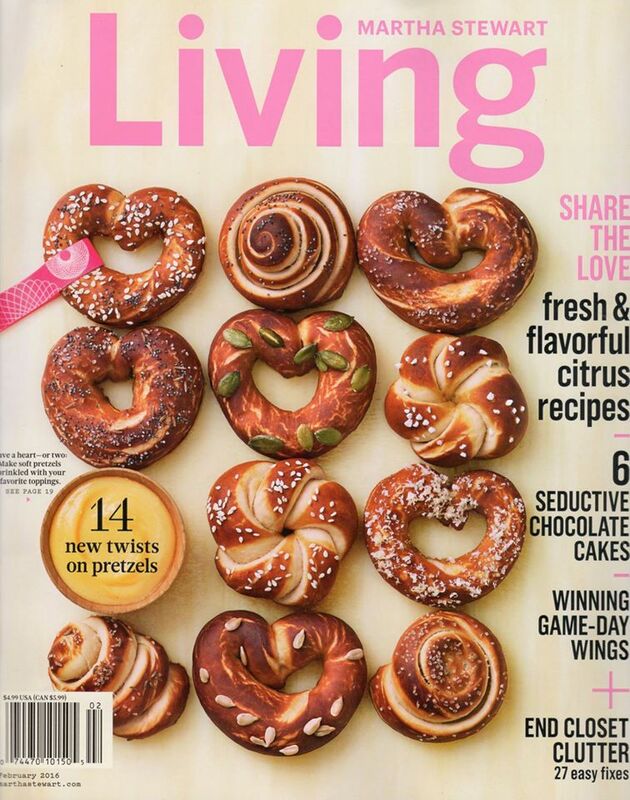 The February issue of Martha Stewart Living is appearing on newsstands and in subscriber mailboxes this week. It looks like a very nice issue! I like the cover with its Valentine's Day variations on pretzels. Okay, so it's another cover with rows of food... I'll take this one on the chin because I think it's actually quite a pretty image. There's also something kind of witty about it, too, since the pretzel was once a religious symbol of unity and marriage. Based on the subheadings it looks like there is a very nice array of content, from Valentine's Day to chocolate cakes to organizing. I'm looking forward to seeing my copy in the mail! Well I guess under the new leadership this is as close to a non food cover we will get. It could have been much worse , it could have been a photo of offals and accompanying recipes. PS looks like Martha's blog will have consisted of less then a dozen Holiday photos of her farm....what a shame ! "When employees of Martha Stewart were laid off on Tuesday, the grim news came straight from the domestic mogul herself. Stewart, the founder and chief creative officer for the brands bearing her name, personally told a "small fraction of employees" within the editorial, digital and video departments at "Martha Stewart Living" and "Martha Stewart Weddings" ........"